Lake Diefenbaker is a reservoir and bifurcation lake in Southern Saskatchewan, Canada. It was formed by the construction of Gardiner Dam and the Qu'Appelle River Dam across the South Saskatchewan and Qu'Appelle Rivers respectively. Construction began in 1959 and the lake was filled in 1967. The lake is 225 kilometres (140 mi) long with approximately 800 kilometres (500 mi) of shoreline. It has a maximum depth of 66 metres (217 ft), while the water levels regularly fluctuate 3–9 metres (9–27 feet) each year. Lake Diefenbaker provides water for domestic irrigation and town water supplies. The flow of the two rivers is now regulated with a considerable portion of the South Saskatchewan diverted into the Qu'Appelle. Prior to the dams' construction, high water levels in the South Saskatchewan would frequently cause dangerous ice conditions downstream in Saskatoon while the Qu'Appelle would frequently dry up in the summer months. Lake Diefenbaker is the largest body of water in southern Saskatchewan, although Last Mountain Lake is the largest naturally occurring one. Lake Diefenbaker was named after John G. Diefenbaker, former Prime Minister of Canada. Lake Diefenbaker in fall, picture taken near Riverhurst, SK. Three Provincial Parks and various Regional park are located on the shores of Lake Diefenbaker: Danielson Provincial Park, Douglas Provincial Park, Saskatchewan Landing Provincial Park and Palliser Regional Park, among others. Recreational activities include fishing, boating and camping. The town of Elbow, Saskatchewan contains a marina for boat storage and house boat rental. The only remaining ferry on the lake is the Riverhurst Ferry, a cable ferry that operates across Lake Diefenbaker near Riverhurst, Saskatchewan. Lake Diefenbaker is home to 26 native and stocked fish species. These include burbot, walleye, northern pike, lake whitefish, lake trout, sauger, goldeye, cisco, yellow perch, rainbow trout, lake sturgeon, longnose sucker, white sucker and shorthead redhorse. Both the current world-record rainbow trout and world-record burbot were caught in the lake. The lake itself along with Battle Creek (Milk River) are the only two bodies of water in Saskatchewan that support a reproducing population of rainbow trout. The lake's sandy beaches provide appropriate habitat for the endangered piping plover. The long stretches of open water and poorly consolidated shore materials makes the shores vulnerable to erosion. Between 1968 and 1992 bank recession rates have commonly ranged up to 3 metres a year with higher rates in exposed areas. ^ "World Lake Database (Lake Diefenbaker)". Archived from the original on 2016-03-05. Retrieved 2015-01-09. 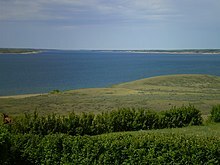 Wikivoyage has a travel guide for Lake Diefenbaker.